The distinctive UWC model of education has deliberate diversity of the student body at its heart. This educational model provides a common framework within which all UWC schools and colleges operate. It does not set down a curriculum, but focuses on what is unique about UWC’s approach to education. Diversity encapsulates the experience of every student in every college. That means students benefit from learning in a diverse environment that helps to broaden their mind and sense of self, and where they gain a portable qualification. This education should take place within a diverse community. The selection of students should ensure representation from regions and social groups that reflect the wide range of tensions among and between people. The core of the UWC experience lies within a diverse community of learners who share a common commitment to the mission and values of the UWC movement. Diversity is supported by National Committees in 150 countries which interview and select students who have made the most of the opportunities they have had and who exhibit qualities that fit with the UWC mission and values. Students then join school communities to ensure cultural, racial, gender, socioeconomic, and language diversity in pursuit of a common mission. In this way, each campus reflects a global diversity that enhances connection, sharing, debate, and community living; and, thus encourages opportunities for growth, empathy, and understanding. Faculty and staff actively engage in community life as teachers, tutors, mentors and learners. 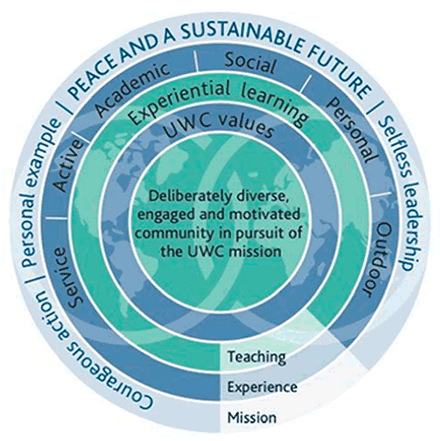 All schools and colleges share the same basic values as outlined in the UWC mission statement – international and intercultural understanding; celebration of difference; personal responsibility and integrity; mutual responsibility and respect; compassion and service; respect for the environment; a sense of idealism; personal challenge; action and personal example. This education requires active promotion of intercultural understanding and the development of genuine concern for others founded on shared life experiences, and cooperative and collaborative living. This includes reflective dialogue on global issues and critical and courageous engagement in the pursuit of peace. Community interaction is placed at the heart of college life. This requires the full and active participation of all members of the school or college. Opportunities for students to practice personal initiative, self-discipline and responsibility, to manage risk and embrace challenge must be provided. Where appropriate, these opportunities are supported by a reassuring adult presence. This part of the model, together with the outcomes, speaks to the values infused in a UWC education throughout the movement. Requires active promotion of intercultural understanding and the development of genuine concern for others founded on shared life experiences, and cooperative and collaborative living. This includes reflective dialogue on global issues and critical and courageous engagement in the pursuit of peace. Students can participate, both individually and institutionally, in positive action to support sustainability. Experiential learning — the process of making meaning from direct experience — is fundamental to UWC. Experiential Education is a more formal pedagogy that employs a philosophical stance and a variety of methodologies. Teachers and staff intentionally provide opportunities for students to engage in activities, exercises, and events to mindfully make meaning and apply emerging skills and understanding. Young people are thrust into a dynamic and diverse community providing them with a plethora of challenging experiences to inspire a range of emotions and learning opportunities. While these experiences can be challenging, joyful, frustrating, and life-changing, UWC provides a safe and supportive environment. By living and working together, students develop empathy and make sense of their experiences through reflection, dialogue, trial-and-error, and perspective-taking. Along with living in a diverse community, students have opportunities to initiate and collaborate on areas that they are passionate about.interact with the wider community, and take advantage of service, creative, and physical opportunities. Underpinning these principles is the pursuit of peace and justice as the founding aim of UWC. UWC schools and colleges offer life-defining experiences for young people, enabling them to discover the possibility of change through courageous action, personal example and selfless leadership. This education enshrines a commitment to the balanced development of the whole person; that is, its task is to encourage an integrated development of human potential across a range of different dimensions, including the intellectual, moral, aesthetic, emotional, social, spiritual, and physical. Students are able to engage in continuing, positive action towards issues of sustainability, on both an institutional and individual level. By bringing together a diverse and motivated student body, immersing them in a global community experience based on UWC values, and challenging them formally and informally, students grow in their abilities to be active global citizens.